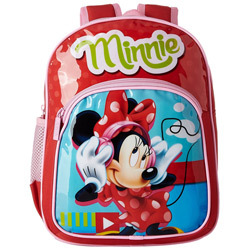 Render happy moments to your loved ones with this Smart Looking Kids Special Minnie Bag in Red and frame it forever in your memory and heart. This Bag in Red Color bear some useful features like Side Pocket to Carry Water Bottle, Butterfly Lock, First Grade PVC Print at the Front, Zipper Closure, 3 Specious Compartments, made of Polyester Material, Colorful Puller with Brand Name, Water Proof and Adjustable Strap. (Dimension-10.5”/4”/12”).